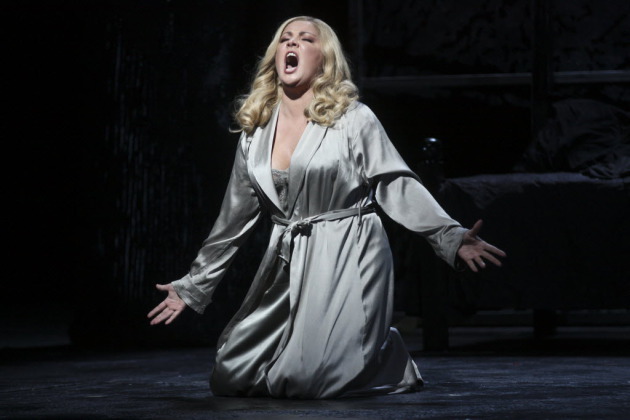 Anna Netrebko as Lady Macbeth at the Metropolitan Opera. Photo by Hiroyuki Ito. Since making her Met debut in 2009 in Donizetti's "Lucia di Lammermoor," Russian soprano Anna Netrebko has sung regularly on the Met stage, and on the popular livecasts from the Metropolitan Opera. This Saturday (noon, Oct. 11), Netrebko will appear as Lady Macbeth live in "Macbeth," Verdi's opera based on Shakespeare's blood-soaked tragedy. Her Macbeth is Željko Lucic in a production that also stars Joseph Calleja as Macduff and René Pape as Banquo. Fabio Luisi conducts this revivial of Adrian Nobles' modern-dress 2007 production. Netrebko gave a "riveting performance dispatched with artistry and fearless intensity," said the critic at Bloomberg news. In a recent interview, Netrebko talked about the challenges she faces as she takes on more dramatic opera roles. In recent years, Netrebko has sung in such Met operas as "Lammermoor" (2009), "Don Pasquale" (2010), "L'Elisir d'Amore" (2012) and "Eugene Onegin" (2013). For these events, crowds gather at movie theaters across the United States on Saturday afternoons to watch and hear big-name singers in big-deal operas, without having to pay for trips to New York City and tickets to the Opera House at Lincoln Center. The live telecasts are usually repeated in the evening on the following Wednesday. To get tickets for this Live in HD event, which is beaming to seven metro-area movie theaters on Saturday, go here. Next up, on Oct. 18, is Mozart's "Le Nozze di Figaro," conducted by James Levine.